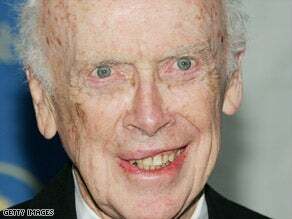 Hey, remember how double helix discoverer and nasty old Nobel laureate James Watson thinks black people are stupid and all homos and ugly women deserve to be aborted? Well, now he says he doesn't actually believe all of that. "To all those who have drawn the inference from my words that Africa, as a continent, is somehow genetically inferior, I can only apologize unreservedly. That is not what I meant. More importantly from my point of view, there is no scientific basis for such a belief," is his new line. Which is not to say that he doesn't think scientists should look for one, according to today's "What I've Learned" feature on the Esquire website, which can be summarized thusly: "The world would be so much better if everyone just had my DNA, or alternately, that of the Ashkenazi Jews, who are so much smarter than everyone else it is only natural and warranted that people hate them, because they have all the money, and we should probably pay them even more money since they are greedy and that is how you motivate these people, to have more children." It's all because he desires world peace! "If you could make people with ten-point-higher IQs, we'd probably have fewer wars," he says. Not to mention, way better weapons!